Forget Motorola, HTC’s cementing its position as the hot Android smartphone maker to watch: It’s just revealed new phones and HTCSense.com, which is a cloud-based rival to Apple’s iOS-MobileMe ecosystem. Forget Motorola, HTC’s cementing its position as the hot new smartphone maker to watch: It’s just revealed new phones and HTCSense.com, which is a cloud-based rival to Apple’s iOS ecosystem complete with intelligent user-centered services. 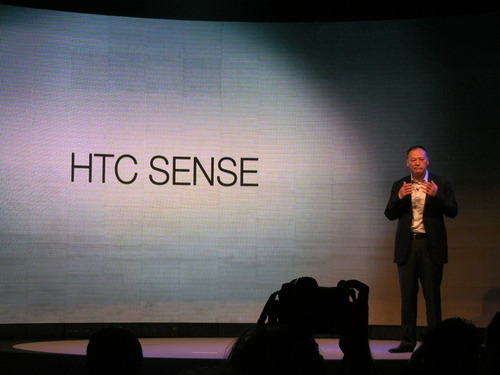 HTC’s had products labeled “Sense” on the market for quite a while: Both are layers on top of smartphone operating systems (Android and Windows) that are HTC’s own take on how a smartphone UI should work. But today HTC has revealed it’s upgrading this system, and taking it into the cloud with a partnership HTCSense.com cloud support network. Intentional or not, this a direct challenge to Apple. The new Sense is an incremental, but significant development on the old edition–something akin to the way Apple’s iOS updates have evolved thus far. Speaking at the London launch event, and noting that, “The smartphone has arrived!” HTC’s Peter Chou introduced the driving force behind the concept: It’s no longer merely about “a phone in your hand” but instead it’s about making that phone smarter, more tailored to how you want to use it. Hence Sense-powered phones will power up more swiftly (under 10 seconds) and when you place them in your handbag they’ll work out what’s going on and ring louder so you don’t miss important calls. Inboxes are unified, so you don’t have to switch between services, maps are pre-cached so you don’t have to wait for new graphic tiles to load when you’re moving or panning through them, incoming calls don’t displace the map so you don’t lose where you are, maps orientate to the compass view and so on. There’s even the power to send messages from HTCSense.com to pop-up on the lock screen of your phone, and to remotely lock the device or wipe it of your sensitive data should you lose it. There’s also an e-book reader. So far these sound like innovations that Apple has long integrated into iOS–particularly with the recent multitasking boost from iOS4.0, and the advent of iBooks–but there’s also DNLA streaming direct from Sense-enabled devices to HDTVs, and the website is reported to give you “full” access to your phone, so as well as caching SMSs and contacts and so on in the cloud, you can configure your phone’s call and SMS forwarding powers remotely (handy if you left it on the coffee table before heading to work). It all sounds pretty interesting, but does it emulate or best Apple’s iOS and MobileMe ecosystems? Sense is quite definitely inspired by Apple’s innovations, but it’s limited to new devices and won’t be pushed out to older HTC smartphones–unlike Apple’s attempt to keep owners of its older hardware up to date and engaged with their devices. It’s as tightly integrated as MobileMe and iOS are, being less about a “layer” on top of an Android phone’s Google OS and more about an ecosystem, and unlike MobileMe all of the advanced features are free. But HTC’s phones seem to lack the “coolness” of other Android devices (perhaps the company’s current PR tag of “quietly brilliant” is to blame), and the hardware isn’t as sleek as the iPhone. So while it may aim at Apple, it lands a more direct hit on Google: Sense, combined with HTCSense.com now seems to be better than the pure Google-branded Android OS itself. And as collateral damage, HTC seems to be targeting Microsoft too–since Windows 7 won’t permit Sense-like overlays, HTC’s shut-out of the OS on the upcoming Win 7 devices it’ll release.